If you want to get a home built frame registered and titled in the US, you need to do a bit of research before you start build what will become a custom motorcycle that is street legal. There is no state that has a requirement to title just the frame. Your actual goal is to title the completed motorcycle. However, titling and registering a home built frame is one of the hardest processes of all the ways you can obtain a motorcycle and title it. Just about every state in America has slightly different requirement, so begin by visiting your local Department of Motor Vehicles (DMV) and asking for printed instructions and forms. Some states have this information online at their DMV website, but it still seems to work best if you actually go in person to the DMV since the website might not be updated and one little requirement change can become a big headache. Be aware that some state have limits on the number of "builder titles" one person can obtain within a set period of time without being a licensed business. Other states have not limits. This is just a point to keep in mind. Also be aware that most state will charge fees for each of the applications you must submit, the safety inspection, and basically will hit you with a fee everywhere you turn. Add this cost into your budget because these fairly small fees can start to really add up during the process. Budget at least a couple of hundred dollars or more for these fees, just so you'll be prepared. Important Tips On Registering A Home Built Frame. One of the most critical steps in obtaining a registration and title for a motorcycle with a home built frame is keep every single receipt for any part you use in building the bike, no matter how small. If someone gives you some of the materials or parts used, you are likely to need a bill of sale stating the gift. If you buy some parts from a friend, get a formal bill of sale. Failing to do these steps will absolutely stop your title application from clearing. After building the frame, you'll need to create a document detailing the frame's construction which you must have motorized. Basically, this document is an affidavit that you built the motorcycle frame, listing all your parts. If you created blueprints or design drawings, it doesn't hurt to have them notarized as well and kept with the affidavit for the home built frame. You'll also need receipts for all materials used in building the frame. This step can be a bit tricky. The state in which you reside might have slightly different requirements, so be sure to cover this topic when you talk to the DMV. However, each state will require some type of proof of ownership of the home built frame. 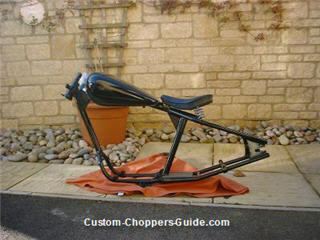 The rest of the step for registering and titling your motorcycle with a home built frame are pretty straight forward. You'll need to be able to prove ownership of the engine and transmission. If these items are now, you'll should be provided a manufacturer's certificate of origin at the time of purchase. Be sure to check that this is included with your purchase. Keep the documents as well as your proof of payment. 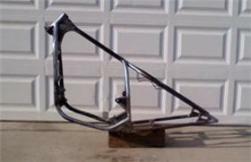 Motorcycle frames which are purchased from manufacturers are stamped with a Vehicle Identification Number (VIN). A home built motorcycle frame will not have a VIN, so once you complete the motorcycle you will need to apply for an assigned VIN using whatever process your state required, usually a form which will be sent in with your proof of ownership of the frame, motor, and transmission. The actual VIN place will be installed during the final safety inspection done by your state, usually performed by a law enforcement officer. You'll also need proof of purchase in the form of bills of sale or receipts for all parts and any labor not performed by you. Some states require each of these documents be motorized. Keep every piece of paperwork you are given in the process of buying parts and components. Motorcycle purchased in running order require an Odometer Disclosure Statement. You'll need to ask your state the exact process that is required to cover this step. Of course, if you purchased a new engine to put into your home built frame, you have this covered with the Manufacture's Certificate of Origin. If you purchased a basket case engine, a used engine or a salvage engine, the process may be entirely different. Usually there is a state-provided form which must be filled out and notarized. You'll likely need a Motorcycle Equipment Certification form which you fill out certifying that the motor has a rating of more than minimum horsepower and motor size which defines a motorcycle in your state. Many states use the rule that the motor must have more than 1.5 brake horsepower and a motor larger than 49 cc. And in most cases, you'll have to have this form notarized also. See how those fees for notarization and applications begin to add up. Final Thoughts On Getting Your Frame Registered and Titled. Last, but certainly not least, you'll need to obtain a Safety Inspection Certificate from your state which is filled out by a law enforcement officer (in most states) who verifies that all state-required safety equipment is installed and operational. This is also the time where you frame VIN will be installed. Once you have gone through all these tedious steps, you must obtain proof of insurance and go to the DMV will all your documentation where you and the DMV can apply for a title and register and tag the motorcycle. It may be a slightly tedious process, but it is how to get a home built frame registered and titled in the US. Remember, your state may use a slightly different process, so do your research with the DMV to avoid unpleasant surprises.